The Parking area capacity of Detroit Airport reaches 18.500 parking spaces. The Departures Level Parking is divided into several areas: Valet, Short-Term and Long-Term Parking. The International Arrivals Parking has Long-Term Parking option only. There is also the Delta Airlines Parking area available for those flying with the airline. Those parking lots are located next to the Ground Transportation Center. The Economy Parking Area is presented at Big Blue Deck and Green Lot. The Daily Parking fares range from $4.00 for the first 30 minutes to $6.00 for parking from 30 to 60 minutes, $7.00 for 60-90 minutes, $8.00 for 90-120 minutes, $12.00 for 2-3 hours, $16.00 for 3-4 hours, $20.00 for 4-5 hours, $24.00 for 5-24 hours, and $24.00 as an additional fee for every day. The Short-Term Parking fares range from $4.00 for the first 30 minutes to $6.00 for parking from 30 to 60 minutes, $7.00 for 60-90 minutes, $8.00 for 90-120 minutes, $12.00 for 2-3 hours, $16.00 for 3-4 hours, $20.00 for 4-5 hours, $24.00 for 5-6 hours, $28.00 for 6-7 hours, $32.00 for 7-8 hours, $36.00 for 8-24 hours. The Valet Parking fares range from $12.00 for the first 2 hours to $16.00 for parking from 2 to 3 hours, $20.00 for 3-4 hours, $24.00 for 4-5 hours, $28.00 for 5-6 hours, $32.00 for 6-7 hours, $36.00 for 7-8 hours, $40.00 for 8-24 hours, $43.00 for 9-24 hours, $43.00 as a maximum daily rate. The terminal allows using Short- and Long-Term Parking lots, as well as the Green Lot and Cell Phone Lot. The Big Blue Deck area, connected with the terminal by the shuttle buses, has direct access to the 4th floor of the terminal. It offers both Short- and Long-Term options. The Daily Parking at the Big Blue Deck fares range from $4.00 for the first 30 minutes to $6.00 for parking from 30 to 60 minutes, $7.00 for 60-90 minutes, $8.00 for 90-120 minutes, $12.00 for 2-3 hours, $14.00 for 3-4 hours, and $14.00 as a maximum daily rate. The Short-Term Parking fares range from $4.00 for the first 30 minutes to $6.00 for parking from 30 to 60 minutes, $7.00 for 60-90 minutes, $8.00 for 90-120 minutes, $12.00 for 2-3 hours, $16.00 for 3-4 hours, $20.00 for 4-5 hours, $24.00 for 5-6 hours, $28.00 for 6-7 hours, $32.00 for 7-8 hours, $36.00 for 8-24 hours and as a maximum daily rate. 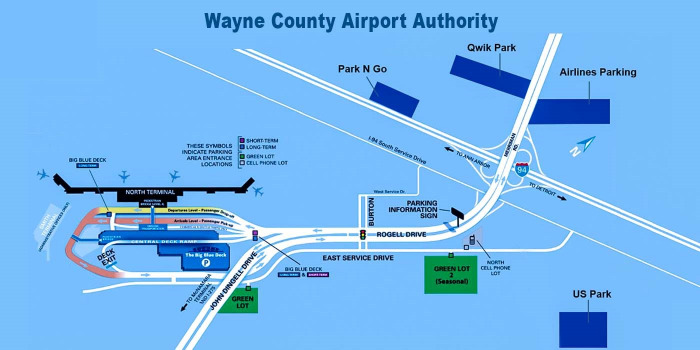 The Green Lots 1 and two are located near the McNamara Terminal and near the Big Blue Deck Parking Area of the North Terminal. The fare for that parking lot is of a fixed price of $12.00 and is not dependent on the time the vehicle was left at the parking lot (unless not more than 24 hours). The Electric Vehicle Charging Stations might be found in the McNamara Parking Garage and at the Big Blue Deck Area.